Symptoms at initial presentation include a sharp pain located at the bony tip of the shoulder, as this is your acromion process. The impingement is occuring due to a lack of space or a reduced freedom of movement between this acromion process and the head of your humerus (arm bone). The pain is worse during overhead activities or movements as this only serves to decrease the subacromial space even more so. Weakness and disability or loss of function at the shoulder are the 2 other key symtpoms; either due to guarding of the shoulder from more pain or a rotator cuff tear affecting one or more of the 4 muscles acting upon the shoulder to dynamically stabilise it. The rotator cuff muscles obviously perform some rotatory movements of the shoulder but are also key in maintaining the head of your humerus (arm bone) in its socket by depressing the humerus, acting with but at the same time against the pull of your large deltoid muscle which is pulling in the opposite direction during abduction or side raising of your arm. 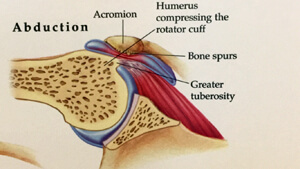 If we have a tear or rotator cuff injury in which this depressive force is not functioning at 100% we see the head of the humerus move upward toward the shoulder blade and acromion due to an increased action of the deltoid impacting the 2 surfaces together; which results in impingement – sharp pain, limited ROM past 60-90 degrees of abduction and some weakness due to the fact that the RC muscles aren’t functioning at 100%. Testing for rotator cuff tears or subacromial impingment involves moving the affected shoulder through passive range of motion, muscle testing of the rotator cuff, and some more specific testing of the subacromial space to try and mimic the impingement symptoms. Your chiropractor can make this diagnosis fairly quickly when combining your history, physical exam and orthopaedic testing. Treatment for impingement usually requires rehabilitation of the rotator cuff to return the head of the humerus into its socket properly, this involves soft tissue therapy to the affected muscles, joint mobilisations of the glenohumeral, scapulothoracic and AC joints, electrotherapy applied to the affected RC mucle can also be beneficial in the early acute stages of injury. Once pain and disability levels are under control rehabilitation moves onto active care with rehabilitative exercises prescribed in order to regain full strength and ROM to the shoulder, as well as to restore the RC ability to stabilize the humerus during movement. For chronic cases of RC tear or impingement a more intensive rehab program will be required in order to break down scar tissue and to return all of the affected tissue to normal states, this will again include the treatment methods above but a more intense stretching routine, cessation of the offending activity and rest. Therapeutic injections and surgery are also other options for treatment but it is suggested a trial of conservative manual/physical therapy be undertaken as this is often sufficient. There are many causes of shoulder impingement it is very important you are diagnosed by a health professional with a solid understanding of the shoulder and its anatomy, they will undertake the appropriate diagnostic tests to ensure that rehabilitation is right for your circumstance.